This is the list of albums which in my opinion are the best ever made. The first 20 entries are sorted, the rest appears in no particular order. To see where it all started, I have added a (much shorter) list of my favourite albums at a time when when I still was a clueless 14-year-old teenager. The arrival of this record in the mid sixties in a musical landscape of striving but ultimately rather conservative bands must have been a minor revelation. 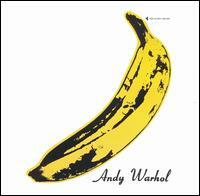 Initially the band was linked to the Andy Warhol scene. Without his patronage they might have not been able to get a record deal at all, yet his influence on their sound and lyrics remained small. But it was his idea to add the German born chanteuse Nico to their line-up, thereby giving this record its special note. Largely unnoticed at the time it took decades until the multitude of ideas displayed here were taken up by other artists. It's no exaggeration to say that nearly all guitar based independent music (bittersweet melodic pop, noisy garage rock, wall of sound orgies, ...) have their roots in some of the songs on this album, although no one was able to substantially improve on the performances here. And, crucially, without this album many of the records in this list would not exist. The best band ever. Not much discussion about this. Of course the magic behind this band can never be fully explained but the key point is it featured two extraordinary musicians which obviously complemented each other in a special way, thereby creating something which was even more than the sum of its parts. This album is the best summary of their early material, better than their eponymous debut. 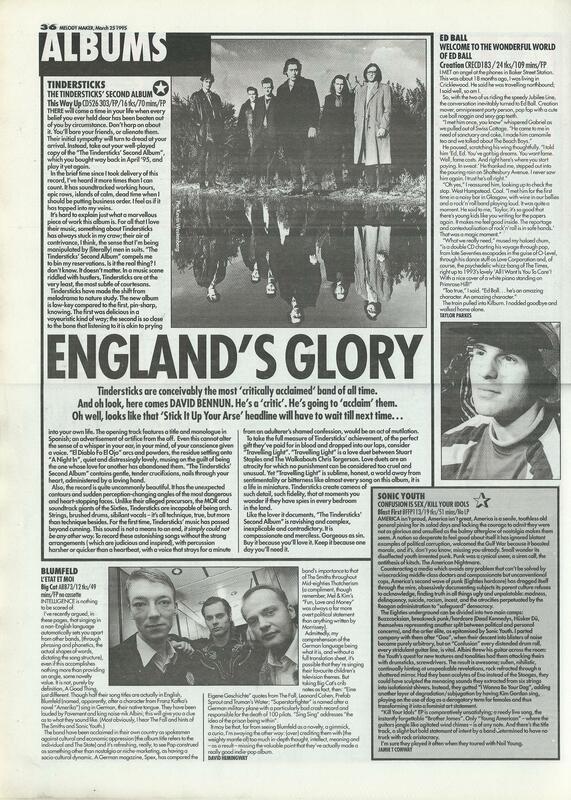 That some of the songs here, which were only B or even C sides, are superior to the best efforts of most other bands, shows how far ahead they really were. 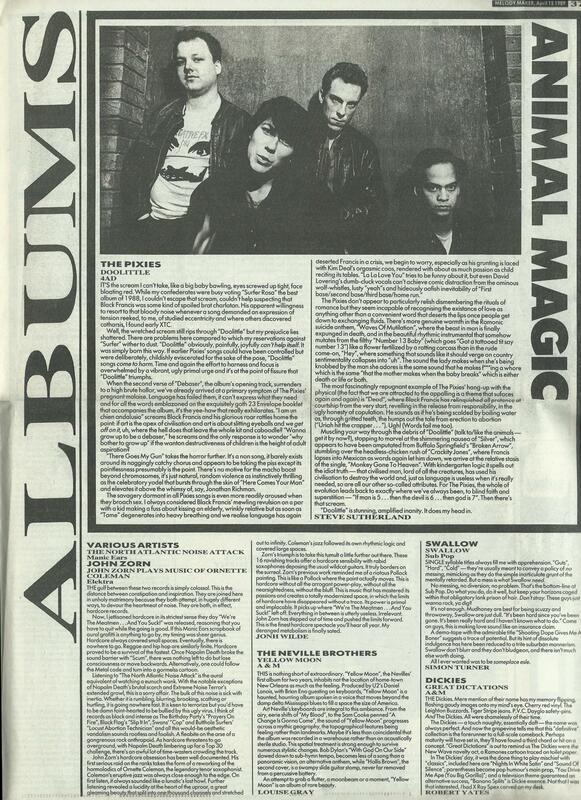 The Pixies are one of the few rock bands it's absolutely impossible not to like. This second album proper has all the weirdness and perversity of their first efforts but this time embedded into songs of real greatness. Only marginally less brilliant. The lyrics are hilarious and J. Marr contributes some of his best ever melodies. And 'There is a light that never goes out' is definitely the best piece of music ever recorded. The formula has been tried before: a singer with a dark voice, a band playing quietly in the back focusing the attention on some very fine string arrangements. But never has this been performed with such impressive skill, such enormous understanding for huge and sweeping melodies. A master class in how to incorporate complex and sophisticated lyrics into regular song structures. It also offers deep insights into human existence at its most desperate and disillusioned. Maybe it was his voice that made him stand out from similar singer/songwriters. Comforting and moving, fragile but always optimistic. This is music at its most authentic. This is the kind of music we should send into space to prove the cultural abilities of the human race. Even after having listened to it a 100 times you will hear things you swear weren't there before. An album remarkable for its second half. The four songs there may be different in pace and instrumentation but share the same sheer unbelievable level of intensity and feeling of near tragedy. Their fun album. 14 songs in 40 minutes and a wealth of ideas that lesser talented bands would use for a 10 album career. Besides they were the best live band ever. As legend has it, their sound was pure accident. Nevertheless it was a massive leap forward. So massive in fact that after 20 years it still hits you like a hammer, the colossal force of guitars totally out of control. This really is an obvious choice. One of the few albums that immediately sounds like a classic. More bands should exhaust their creative powers in one year instead of spreading them over a lifetime. For a debut album this is incredibly accomplished. His special guitar technique already fully realised, string arrangements in the right places and songs with no connection to any music previously made add up to an enchanting whole. Impossible to say why this record is that good. Perhaps it's the lack of any distinctive features and characteristics. It seems that they themselves were quite puzzled about the ongoing fascination their work created. One of the most underrated bands ever deliver a template for guitar music in the 90s that sadly nobody had the talent and virtue to take up and carry on. OK, this is a compilation and shouldn't be in this list. But it doesn't feel as one and as it contains an unrivalled sequence of singles most of them not on regular albums you really can't ignore it. There weren't called 'god's backing band' for no reason. This list may contain a certain share of melancholic albums, but this one more than compensates by being as euphoric and ecstatic as possible. Any musician who claims his music is influenced by drugs should listen to this and shut up. A band at the height of their powers. This is perfect spring, summer and autumn music all in one quarter of an hour. They should have split after this, but nobody's perfect. In a stark contrast to their first two albums this fascinates with a simplicity that puts the focus on the essence of some of Lou Reed's best compositions. Should best be listened to with the lights down. This has all the rage and energy of the punk era, the cleverness and inventiveness of the post-punk bands and that extra portion of genius that characterises all Joy Division and New Order albums.